You’ve all seen them. 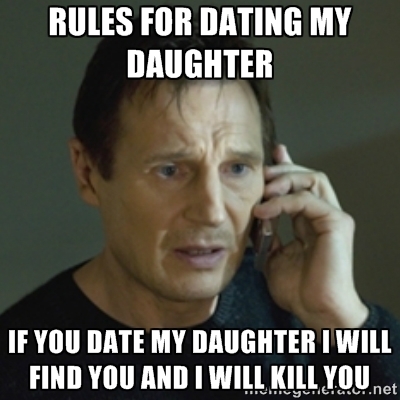 The pictures, the posts, the memes with a father and his infant / young / teen daughter. Sometimes the father has his arms crossed with a scowl on his face. Other times he’s holding a gun with the same menacing expression. Sometimes there’s even older male siblings practicing being a bodyguard. All of these with the intent to intimidate and be confrontational when it comes to future male suitors for their daughter. “To get to her, you have to go through me first”. I know, no big deal right? Harmless fun. Only I find these things laughable and ridiculous for a few reasons. a) It shows that there is absolutely no faith that boys can be raised to be respectful and polite to women (or by default to people in general). Instead of raising daughters to fear men, lets raise our boys to respect women. To have self-worth. To say it’s wrong to go against a woman’s wishes. To stand up to those who do. b) It shows that those fathers have zero confidence in their ability to raise their daughters. If they truly believed they could raise a self-aware, strong, confident woman then this whole song and dance becomes pointless and unnecessary. It shows no confidence in their daughters ability to be a good judge of who she befriends. c) It shows that feminism still needs to be talked about. It shows that woman are still weak and feeble creatures that need their fathers with guns to protect them. It shows ownership over someone else’s body and decisions. Yes I have a daughter. No, I will never bully or intimidate a friend or future boyfriend or girlfriend she brings home to meet me. If s/he is worthy enough in her eyes to bring him/her home, then s/he worthy of my respect until s/he proves otherwise. This thought process of the possessive, over-bearing father is outdated and rooted in insecurity.